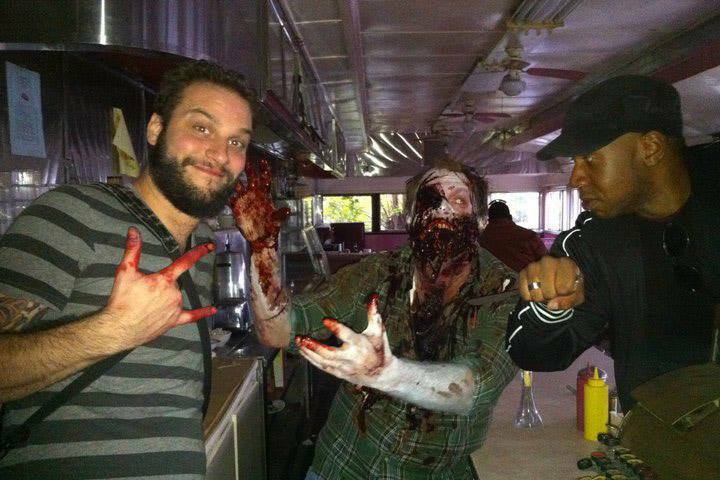 Doug worked to coordinate and create all the SPFX for this zombie horror/crime movie directed by Jeff Stewart. Practical FX included chainsaws cutting off heads, gunshots, throat rips, bones being broken, legs being ripped off and more! The story also required an army of zombies for which Doug coordinated a team of 6 makeup artists including Marissa Masella, Paul Mafuz, Steve Saturn, Josh Potter and Autumn Eget to create over 25 zombies for the movie. The story revolves around Braxton & Ben, two childhood friends who end up in the drug trade. When Ben is sent to jail, Braxton decides to call it quits and become an honest businessman. Ben is released early and is threatening to destroy everything Braxton has built. With no choice Braxton enacts a plan to “deal” with his former friend and business partner, but before he can take action all hell breaks loose. Now the former friends must work together to stay alive against an onslaught of the undead.